I’m updating my logo from my hand drawn logo to a logo done by a graphic designer. What ya think? Better? Is it easy to tell tha the tool in the picutue is a rasp? The rasp I use look like the drawing. http://www.lie-nielsen.com/cabinet-makers-rasps/. So I was trying to mimick that. I like it better without the dark background. Good thoughts! re: rasp. Oh, please don’t go with the square end rasp. That may be more like a commonly seen device at the borgs, But we just can’t go there. 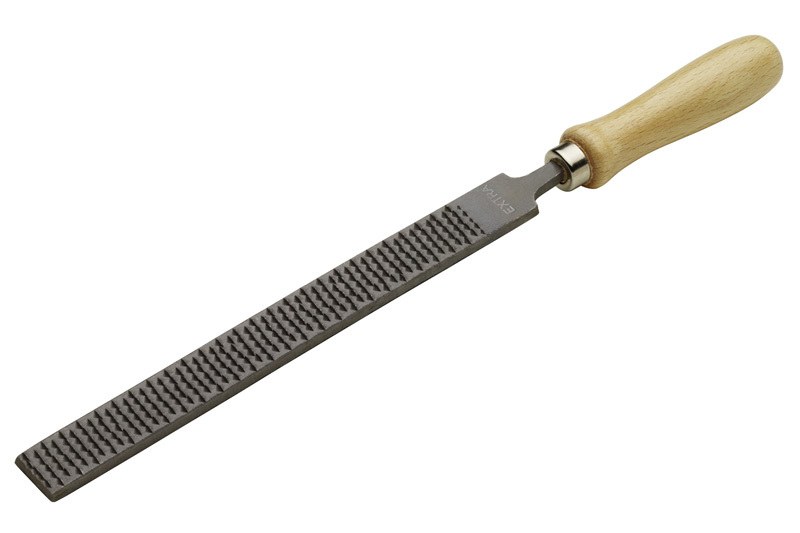 I believe the current rasp is identifiable to fine woodworkers, but to an outsider it may look like some sort of kitchen device. The airbrush (shading) look seems very cold and sterile which does not convey your work and process. The pointy end to the handle does not amuse me, even if that is the style of your favorite rasp. And the spacing between that pointy end and the cap “S” just kissing disturbs. You have air on other boundaries. If you are gonna merge, then you should make an overlap. Which that would be out of place were that the only change, me thinks. Why did you choose a rasp? I like rasps but they might not be as universally recognized. Speaking of rasps. Yes, we were. A rasp is a working tool. Why is it statically flat (and on its edge no less) and trapped by the letters? Makes for a nice logo block to fit various formats, but does not convey any action. Why the gap between the “Woo” and “D”? Why is the “D” dropped? I see “Woo” trying to be a word and my brain can’t handle it. Between the gap and the lowering, the “D” appears to be falling away from the logo. Which is an action. Points for that. But not where you want to get points. Can you put a before and after on this page? I sort of have an impression of the prior, but I’d have better feel for the process if given the original and the proposed. where is the wood she speaks of? or the she? or the works? I was able to have this done via Fivver.com. I paid $15 for it (grafic designer in a box), so I’m a bit limited on just how much I can adjust. I should have hired Tom Buhl to do it! Doh! Looks great! I really like it. I think it looks fantastic. Nice work. Thanks Jonathan! Say we’re nieghbors .. some what. I’m in Seattle. I also added you to the blogs I follow on my reader. A nice refresh, but I agree with Tom, there is something not quite right with the lettering, perhaps tapering vs, abrupt/bumpy size changes, switching to sans serif typeface and/or moving to all caps? What feelings/aspects about yourself/work are you trying to convey? While I like the additional shading, I’d compare it to it’s single color conversion. Shading can often change the form you see at a glance, you may find the shading too dark and at small scales looks like a knife. Given the “look” of your page, I’ll also suggest switching to sepia over greyscale at least on your site. Consider how it fits in a square, which is the shape that seems to currently in vogue and will be used by gravatar, twitter etc. I like the rasp, as it makes you stand out, that rasp is different than saws or planes others may use and stands out even at small sizes, If this was to be a larger brand, attracting non-woodworkers it might be obscure, but I think your target audience “gets it”. These are my unfiltered honest impressions, I’m not in this business, but try to hone my design skills regularly. In the end, if you like it, that is all that matters. Our avatars are by definition very personal, and shouldn’t try to please everyone. You are very brave, I’m not sure I would have the confidence to ask others what they think of my logo. LOL! Actually, I do have a hand stitched rasp. 😀 They’re awesome aren’t they? All thoughts most helpful. I’m gving input to my designer. i don’t know a lot about rasps, but aren’t they generally flat on one side and rounded on the other? if you look carefully at where the handle joins the rasp, it seems that it’s round on both sides… that kinda threw me off. also… the massive S cap and the D cap at the end completely throw this design off. part of that has to do with the use of a serif typeface, as well as the big difference between the x-height of the typeface (x-height is the height of a lowercase “x” of any given typeface) and the cap-height/ascender height (ascender-height is the height of the tall lowercase (eg. h, l, k) letters of a typeface). a good logo has a sense of place. it’s focused and has “gravity”, for the lack of a better term. having a) massive letters at the start and end of the wordmark as well as b) vastly different heights of all the letters in between really makes for a design that floats around and doesn’t really sit on the page with authority. Great feedback, thanks. And some really good ideas too. I still want to create a rasp image that is simple lines, no shading that I might be able to use as a stamp for tools. Either that or “SWW”.